The Rebel Sweetheart. : Spotlight | Peripera Fashion People Carrier Mini Luggage Set. Spotlight | Peripera Fashion People Carrier Mini Luggage Set. For this summer, Korean beauty brand Peripera launched an eye-catching set of their best-selling inks and tints, all in miniature sizes. 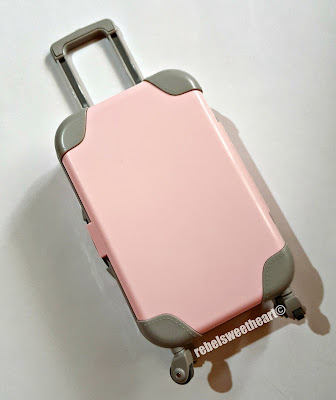 And I say eye-catching, because its packaging is an adorable pink trolley luggage, complete with wheels, a retractable handle, and stickers for you to decorate the luggage with. I was not able to buy this while I was still in Korea, as this product hit the stores a few days after we left the Land of the Morning Calm. Thankfully, Rox of Ciel Azure still had a few pieces available; I purchased one right away, because this limited edition item sell like hotcakes online! 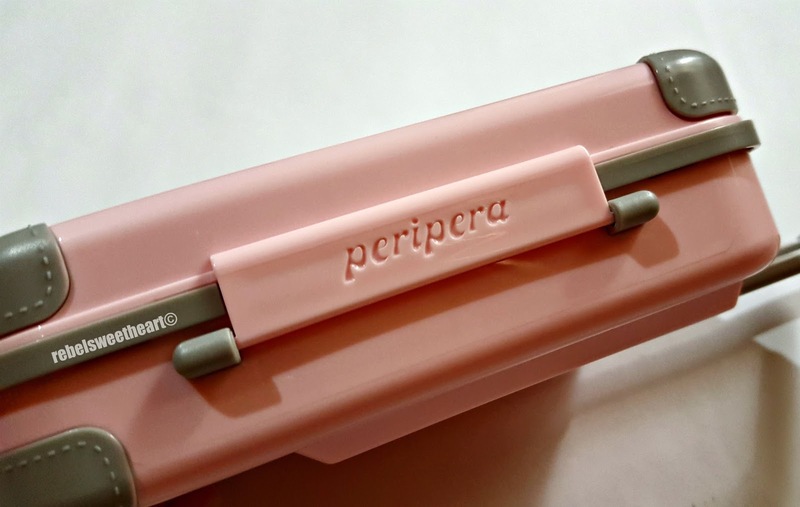 Unboxing the Peripera Fashion People Carrier. 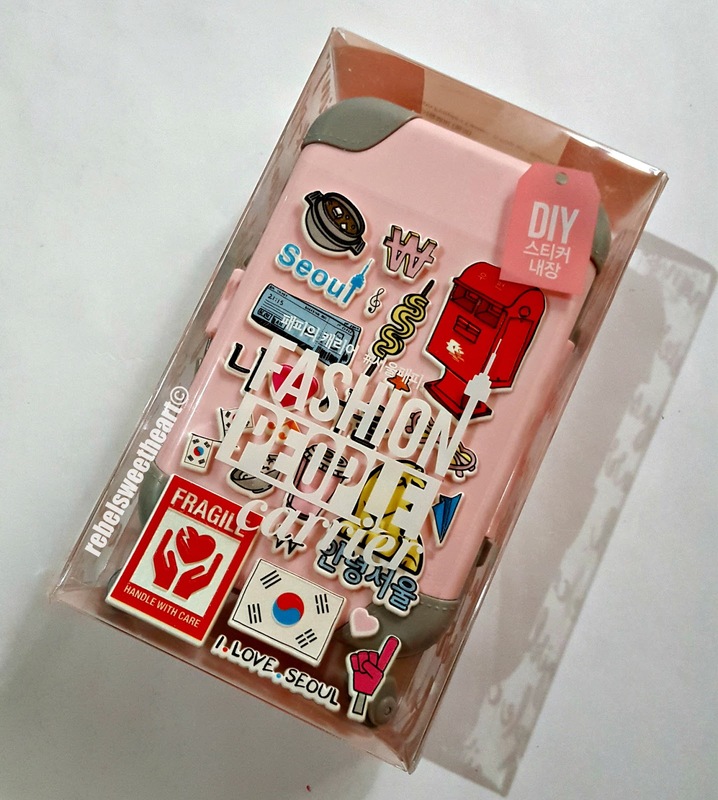 The Peripera Fashion People Carrier comes in two different colors - New Yorker Yellow, which features New York-themed stickers; and KPop Girl Pink, which features Korean-themed stickers. Mine is the latter, because... Korea! Mini luggage with wheels + retractable handle. Peripera logo at the side. Product details at the back of the box. 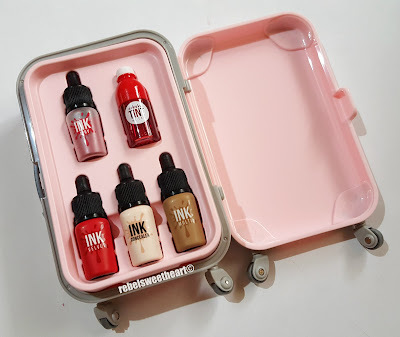 Inside the luggage, you'll find miniature bottles of the following: Airy Ink Velvet (2.7 grams), Vivid Tint Water (3.5 grams), Ink Velvet (2.7 grams), Ink Concealer (4.2 grams), and Ink Multi-shadowing (2.7 grams). The luggage, by the way, has the same dimensions as my Samsung Note 5. The bottles are made of plastic, about 2 inches in size each, and all come with doe-foot applicators. Shade reference at the bottom. 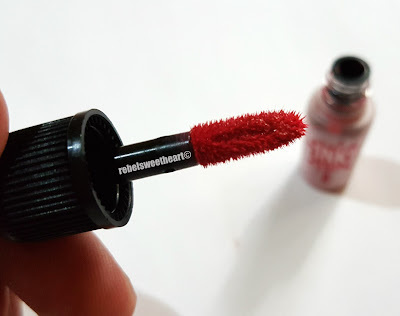 The Peripera Airy Ink Velvet is a souffle cream lip stain with a velvety matte finish. The shade included in the set is #5 Elf Light Rose, a lovely, muted shade of pink and one of the most popular shades in the Airy Ink Velvet Line. 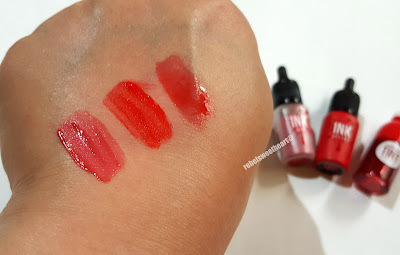 Peripera Airy Ink Velvet #5 Elf Light Rose. True to its name, this product feels light as air when worn. It's also long-wearing, as the color does not budge even after a full meal and a cup of coffee. However, this product has a rather strong floral scent, which may be a turn-off to some. I certainly do not mind, though, and I might just buy a full-sized version of this shade the next time I fly to Korea. #5 Elf Light Rose when worn. 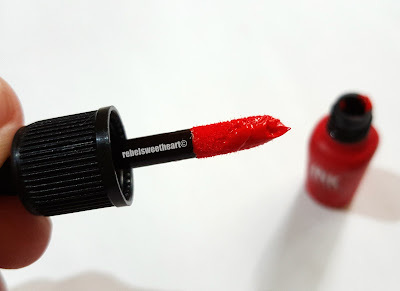 The Peripera Ink Velvet is a creamy, lip stain with a lacquer-like matte finish. 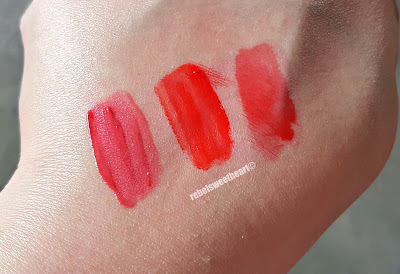 The shade included in the set is #2 So Grapefruit, a warm and bold red with orange undertones. Peripera Ink Velvet #2 So Grapefruit. Like the Airy Ink Velvet, the Peripera Ink Velvet is lightweight, easy to apply, and does not dry the lips. It has a subtle, sweet scent - much lighter compared to the Airy Ink Velvet's. The color pay-off is gorgeous, and the wear-time - an impressive 12 hours. I've had lunch, dinner, went to sleep, took a shower the following morning and the color is still there. How amazing is that?! #2 So Grapefruit when worn. If matte lip products aren't up your alley, then you might find the Peripera Vivid Tint Water more to your liking. Made with real fruit extracts, this water tint has vibrant color and a mild and fruity scent. The shade included is #3 Apple Squeeze, a sheer berry red shade. Peripera Vivid Tint Water #3 Apple Squeeze. 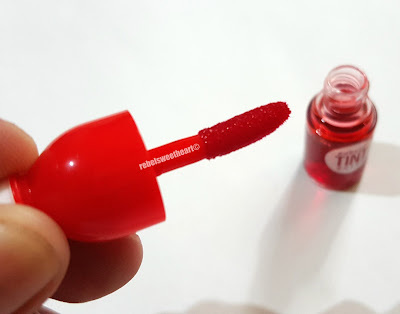 Like most lip tints, this one has a thin and watery consistency. It's lightweight, moisturizing, and has buildable coverage. However, it's not as fast-drying as my favorite Labiotte Wine Lip Tint, and has a tendency to seep through your mouth and stain your teeth. Despite that, I like this lip tint nonetheless. #3 Apple Squeeze when worn. Ink Velvet #2 So Grapefruit, Vivid Tint Water #3 Apple Squeeze. 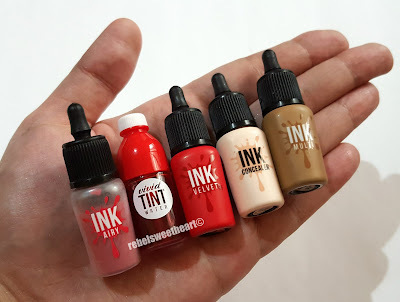 Now as for the two other products included in this set, I'm not too keen about them because both the Ink Concealer and the Ink Multi-shadowing come in shades that are a little off for my skin tone. Ink Concealer on the left, Ink Multi-shadowing on the right. 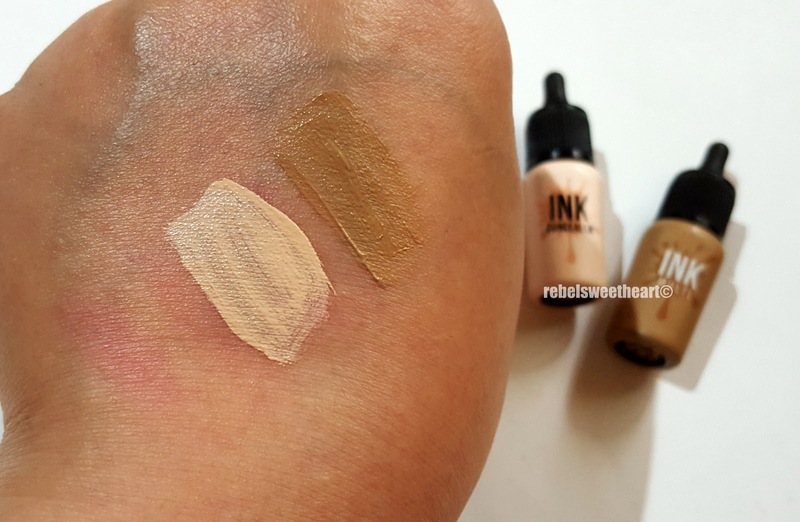 What I do like about the Ink Concealer is its silky smooth and long-lasting coverage. This product is available in two shades - #1 Cover King Vanilla and #2 Blemish Hider Beige. 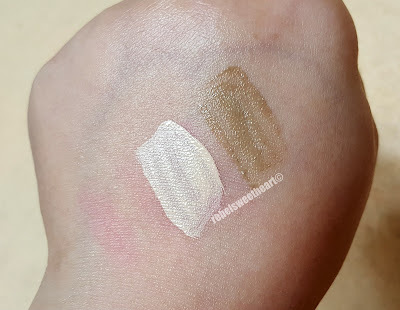 I reckon the darker shade would suit my skin tone better, unlike the shade that came with the set which looks ghastly white against my skin. 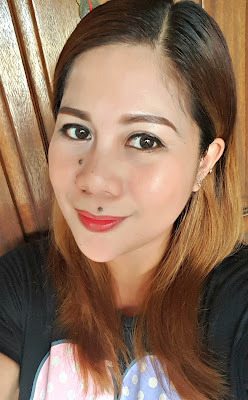 As for the shading cream aka Ink Multi-shadowing, I tried contouring with it, but the shade just sort of disappears when blended on my skin. This product also doubles as an eyeshadow, but I hardly wear eyeshadows these days. LIPS: Peripera Vivid Tint Water #3 Apple Squeeze. All in all, this set is a nice collector's item, especially if you're into Korean (beauty) products and a sucker for cute packaging like me. With regards to value for money, I'm on the fence because the concealer and shading cream didn't work well for me. Part of me wishes that they should have just included four lip products and a BB Cream, the way they did when they released the Mini Girl's Cabinet set last year. 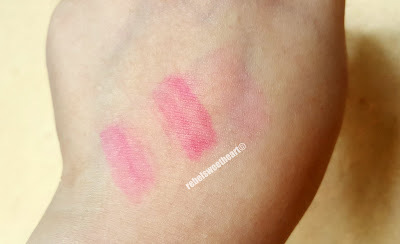 But then again, I do love the lip tints and the Airy Ink Velvet is such a wonderful beauty discovery! The Peripera Fashion People Carrie is something I would love to have for sure. It is really cute and I like the products inside of it. The color of the Vivid Tint Water #3 Apple Squeeze I really love. Thanks for sharing these awesome products. 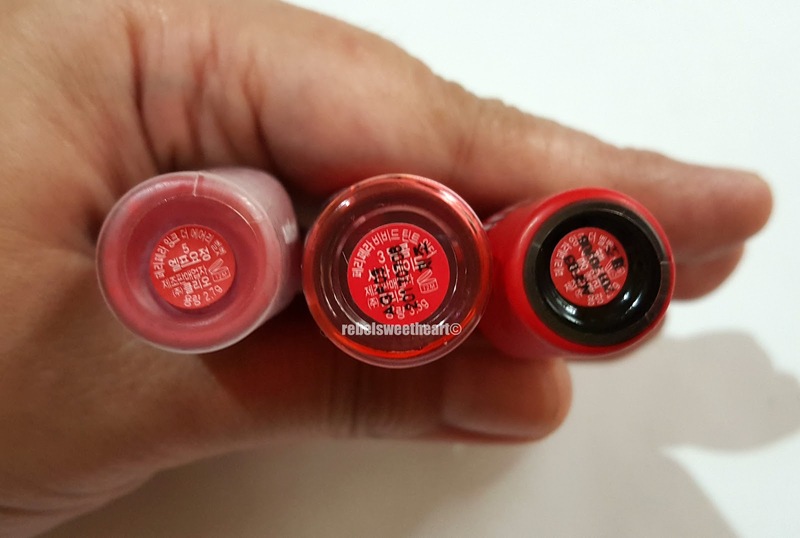 Oh they're lipstick pala! Nice! I saw someone post a photo of this on Facebook but wasn't able to check the caption (pardon the makeup ignorance). They look so pretty and the shades are nice. I love the packaging! And the items inside, they are small but terrible the lip tints has good colors too. The concealer though, looks sheer and too bright? Totally buying this just because it's SO cute! I don't use concealer but I'm definitely going to use the tints. Love the colors! These are so cute! Perfect as a gift for your girlfriends :) I'm sold! Oh-em-gee! I sooo love the packaging! And the colors of the lip tints are all so nice din! <3 Sayang lang dahil medyo off pla yung kasamang concealer. 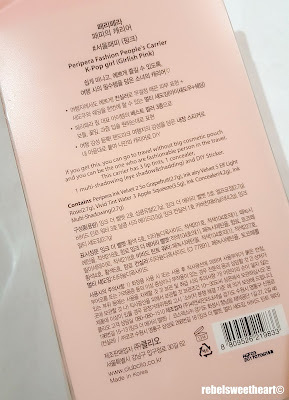 Mas better nga cguro if they included a bb cream instead. Haven't tried this Korean brand. The swatches look interesting. 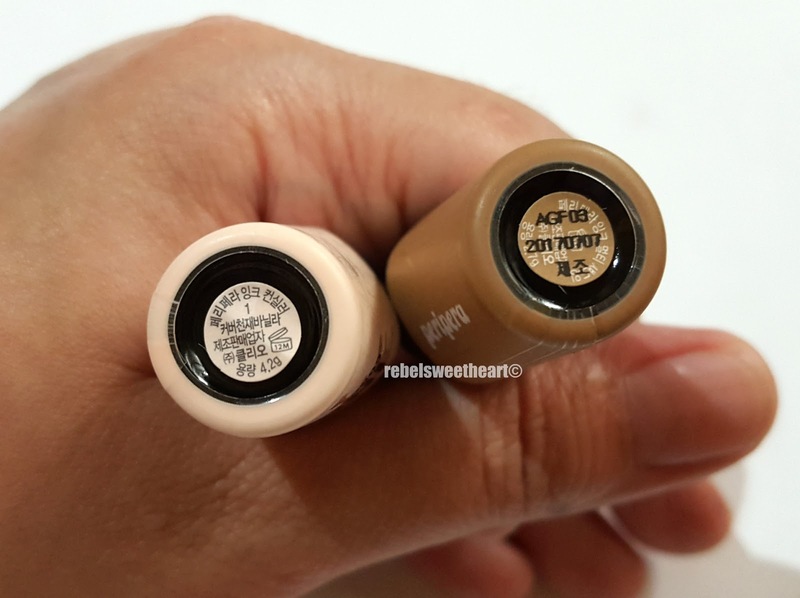 However, like most Korean brands, their shades are limited for concealers. The packaging is so cute and I think I like the Apple squeeze tint.